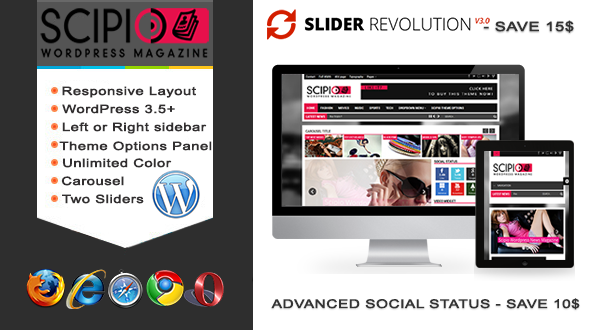 Scipio responsive wordpress theme is a Responsive Magazine WordPress Theme designed specifically for magazine style and blog websites. 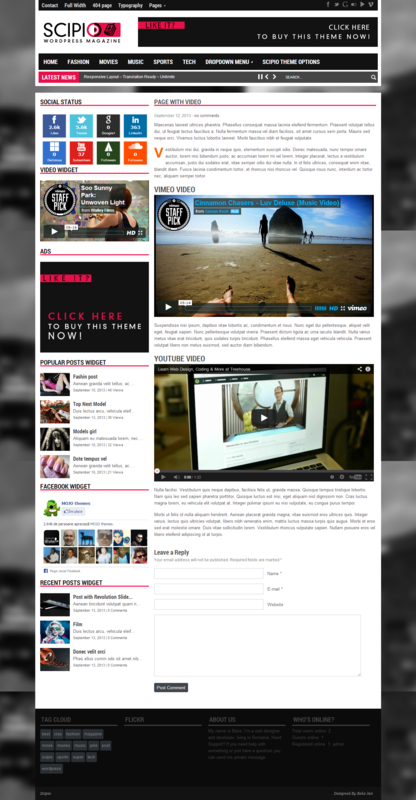 The theme is clean, nice and fully responsive. With its professional layout, it’s easy to customize. 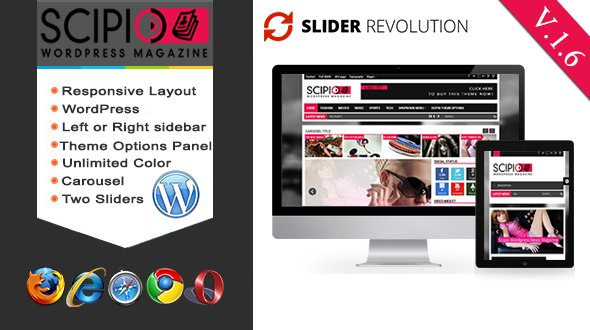 It provides everything you’ll need to create a professional looking website. Scipio is compatible with WooCommerce. How to translate my Scipio theme? 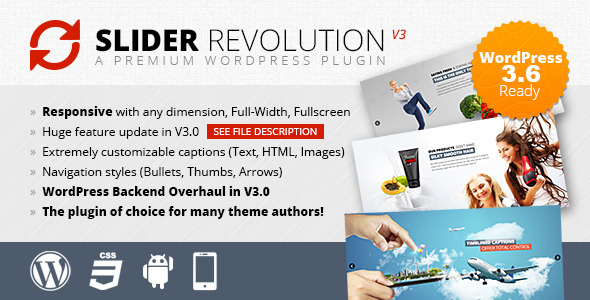 Install this plugin http://wordpress.org/plugins/regenerate-thumbnails/ . Regenerate Thumbnails allows you to regenerate the thumbnails for your image attachments. This is very handy if you\'ve changed any of your thumbnail dimensions (via Settings -> Media) after previously uploading images or have changed to a theme with different featured post image dimensions. All pictures must be at least 700 pixels X 340px for correct resizing. What should I do?” --- This is not a theme issue, it occurs when WordPress tries to access more memory then its allowed to by your Server PHP configuration or WordPress Settings. Simply Increasing Memory will solve it straight away. If you are on a shared hosting, dedicated or VPS, just FTP access to your server will be enough. You can do the necessary changes by the follwing 4 methods: 1. Open or create the .htaccess file in the root directory of your WordPress instalation and add the following code: php_value upload_max_filesize 128M php_value post_max_size 128M php_value max_execution_time 300 php_value max_input_time 300 2. Open or create the php.ini file in the root directory of your WordPress instalation and add the following code: upload_max_filesize = 128M post_max_size = 128M max_execution_time = 300 3.Open your wp-config.php file in the root directory of your WordPress instalation and add the following code: define(\'WP_MEMORY_LIMIT\', \'128M\'); 4.Contact your web hosting provider or the person that manage your server and ask to increase these limits for you. Depending on your needs, the number of plugins that you use, server condition, how big is your site, you could use 32M, 96M, 128M, 256M, 512M, 1024M, 2048M, 4096M. Make sure your server configuration allow you to use that much dedicated memory..
1. Download the free Poedit software from here http://www.poedit.net/ 2. Navigate to your theme folder scipio/languages 3. Using Poedit software, open scipio.po file 4. Translate all the words and phrases in your language, then save the files to your hard drive and change its names according to your language code; e.g. for the French - Français you must save it as fr_FR.po Please make sure that you have selected All files on save, so that the software will generate a .mo file too, which also need to be renamed according to your language code. 5. Delete the default scipio.po and scipio.mo files from your languages folder then upload the new ones you ve just saved(.mo and .po) to scipio/languages. 6. Navigate to your main WordPress directory and open wp-config.php and search for: define(\'WPLANG\', \'\'); 7. Edit this code according to your language code and files you\\\'ve just saved with poedit; e.g. for the French - Français you must add: define(\'WPLANG\', \'fr_FR\'); Another example: for the Portuguese spoken in Brazil you must add: define (\'WPLANG\', \'pt_BR\'); Once you\\\'ve added your language code, save the file. That\\\'s all !